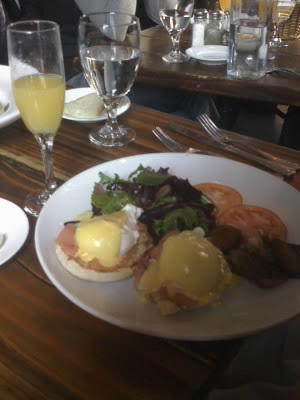 Ahhhhh, a Sunday all-you-can-drink prix fixe brunch in the Meatpacking. So hit the spot! Right on the heels of Restaurant Week, we've got good ol' Fashion Week (but at least fashion week is a true week, unlike RW which was 2 weeks). Anyways, I shall report from whatever scraps of Fashion Week get thrown my way, as occasionally I happen to be in the right place at the right time, wearing the right dress ;). Thanks go out to Amanda, for going with my crazy flow this weekend, and knowing to keep the mimosas coming.